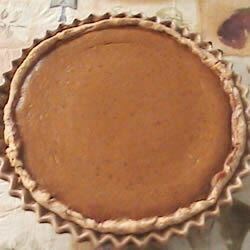 "My husband never liked pumpkin pie until he tasted mine. I don't know what makes mine so different but here is the recipe. White sugar may be used in place of honey." To Make Pastry: In a large bowl, mix together flour, 1 tablespoon sugar, and 2 teaspoons salt. Cut in shortening until mixture resembles coarse meal. In a small bowl whisk together vinegar, 1 egg, and ice water. Pour into flour mixture and stir until dough forms a ball. Divide into 4 portions. Freeze 3 of them or use for other pies. Reserve one for Pilgrim Pumpkin Pie. To Make Pumpkin Filling: In a large bowl, combine 2 beaten eggs, pumpkin, 3/4 cup honey or sugar, 1/2 teaspoon salt, cinnamon, 1/2 teaspoon ginger, cloves, and evaporated milk. Mix well. Roll out pastry and fit into a 9 inch pie plate. Pour in pumpkin filling. Bake in preheated oven for 15 minutes, then reduce heat to 350 degrees F (175 degrees C). Bake an additional 45 minutes, until filling is set. This is a great pumpkin pie. I used the recipe to make 2 pies instead of one - which was a mistake. Next time I will make just one fat pie! Thanks!